is who is working on what and when. Our colour coded live jobs screen does exactly that. 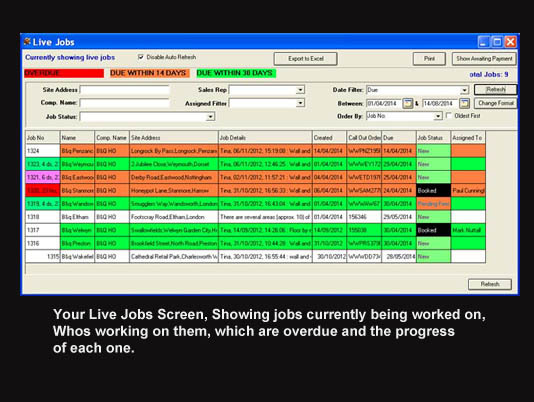 All your live jobs are available on one, colour coded, screen using your choice of colours. Listed in due date order, showing a brief summary of the site address, the client, the assigned engineers, the current job status, the due date and several other options. There are 18 built in formats you can use to show this data in various ways. The different formats enable you to view the most appropriate data for your company enabling you to make decisions based on workload and progress. The colour codes can be used to show which jobs are in progress, overdue or due soon. If you run to SLA you can also have a live countdown of the available time left to fulfil your SLA, giving you the ability to assign additional resources to a job if your running over.